Developed in conjunction with Zero Motorcycles and Be Karting, the E-kart features a totally new innovation for the electric market: a battery removable in less than one minute. This optimises costs: as the run time and charging cycle of the battery are identical, it allows for a continuous cycle of use for the kart. In addition, E-kart featuress the most compact and lightest battery in the market for the amount of energy it contains. Its nominal voltage is 102 Volts and it utilises Lithium Ion chemistry. The weight of the battery box is 21kg, box included. Thanks to the functional simulation and on-track tests done by the Birel ART R&D department, the integration of the powertrain and the management software has been optimised, in order to ensure safety, reliability and performance, stability, consistency, low weight and balance. The motor type is FXS 75-5, the maximum torque is 57 Nm and the max power is 27hp (20 kW), at 3700rpm. The power pack max capacity is 3.6 KWh and it is air cooled with an IPM Motor (Interior Permanent Magnet) for significantly better cooling. The estimated pack life to 80% is 1.350 hours (indoor track). 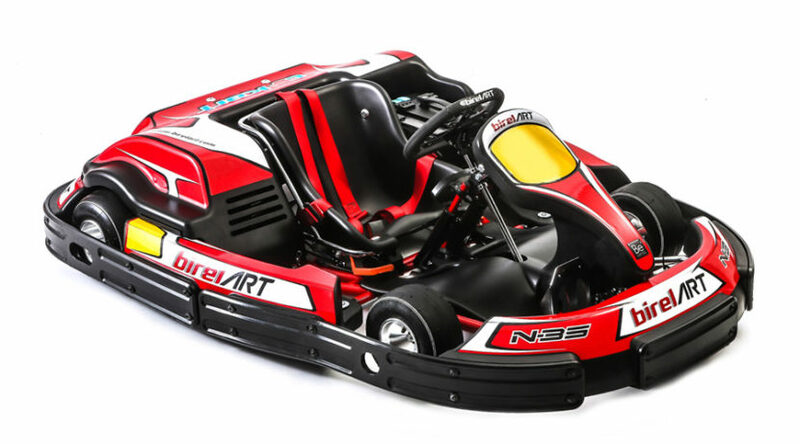 The complete kart weighs 165kg, lighter than the competitors in the market. The E-kart tethered to the chassis for ease of maintenance, in order to protect moving mechanical parts, engine and cabling.